When my makeup obsession first started* I was baffled by ‘makeup speak’, particularly all the terms relating to eye makeup application. I felt like screaming “Slow down! Speak English!” Yet, I’ve realised, looking back over some of my older posts, I’ve fallen into the same trap, talking about the “inner corner” and the “upper waterline” left, right and centre. Opps… Sorry. I should know better! So, here’s a post for those of you who aspire to wear eyeshadow but might not know where to start. I know there’s a few of you out there as one of the makeup questions I’m most frequently asked is “Eyeshadow – Where do I apply it?” This is such a great question and one I’m going to answer right now! Alternatively, you might have eyeshaow basics down pat – but you are keen to take things to the next level. In this blog post we’ll walk through the different parts of the eye from a makeup perspective and answer the question ‘Where does it all go?’ My hope is that this helps makes eyeshadow application less intimidating and heck, you might be able to follow eye makeup tutorials without feeling like an amateur (like I used to). This can be split into several different parts, or, you can keep it super simple and just think of it as one entire place and apply one colour all over your eyelid, stopping at the natural eye crease. I’m down with keeping life simple. However, if you reckon you are ready to graduate onto the next step (congrats), you can ponder this: Eyeshadows are often applied in threes: Ever noticed that eyeshadow palettes are often trios? Along with applying these colours in the crease/browbone/outer v (keep reading) what you could do on the lid is this: Apply the mid-toned colour in the middle of the lid. Apply the lightest colour on the inner lid. The darkest colour, you got it: This goes on the outer third of the lid. To ‘mesh’ them all together, take a fluffy brush and, at the seam of where each of the eyeshadows meet, gently blend away so the seam disappears and the colours morph into each other. Which brush to use for this step? I’m a BIG fan of MAC’s 217 brush, it’s absolutely worth forgoing the purchase of new undies at Farmers’ next big sale and investing in one of these instead (NZ$48). In case you were wondering: Why wear more than one colour on the lid? To give the eye dimension, shape and generally to glam it up a bit. MAC’s 217 blending brush has fine, densely packed fibres that are arranged in an oval shape for shading or blending of colour or creamy products. Your crease is the indentation above your eyelid. The easiest way to find it is if you feel around under your brow bone to find your eye socket: The crease follows the shape of your bone. Colours worn in the crease are designed to give dimension and contour the eye shape. To achieve this we use a colour that is darker than the colour(s) used on the eyelid. The crease colour will also gradually fade the closer you get to the inner part of the eye. Right, we need to talk blending (you are going to get sick of that word shortly): The crease colour should be applied with a relatively fluffy blush and then you should “blend the hell out of it”. If you have hooded lids bring the colour up above your crease and blend it up towards your brow bone**. Move your fluffy brush a ‘window wiper motion’, in a rainbow shape, backwards and forwards through the crease, sometimes up to 20 times (often more) to make sure the shadow is beautifully blended! It’s pretty tedious, I’m not going to lie. Best brush for this? Go MAC’s 217 again (I clean this off on a towel in between uses). Seriously, I give this brush a whole lotta lovin’. What colour eyeshadows to use in the crease? 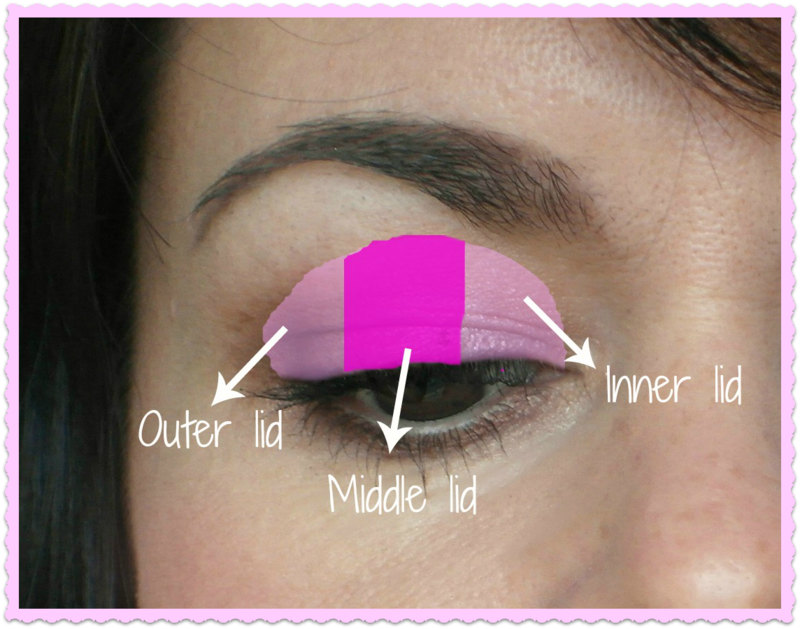 Coordinate your crease colour with the lid colour. For example, if you’ve applied gold tones on the lid a mid-tone brown will look lovely in the crease. 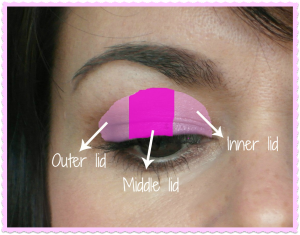 If you’ve used purples on the lid, apply a darker purple or a navy in the crease. I love using matte or semi-matte eyeshadows in the crease to add depth and also balance out the look as I typically like to wear sparkly shades on my eyelid (I’m not keen on the disco ball look). The outer v is called this as it’s shaped like a sideways letter v. Frankly, trying to work out where this was caused me to get my knickers in a total knot when I was an eyeshadow virgin. Assuming you’ve managed to find it, aided by my diagram, then on this part of the eye you use a darker colour, like a dark brown, grey or black. Why? This is all about creating a deepening effect, again for dimension. I personally like defining my outer v to make my eyes look bigger and, um, sultry. As you do. Caution: Don’t be tempted to use a light sparkly colour on the outer v… This is because light and sparkly attracts and reflect light: The goal with the outer v is to create a dark and smokey effect. In terms of brushes to be used here, this’ll depend on whether you’ve got big or small eyes. I’m blessed with big ones (immature snort) and so I often use my MAC 217 for this step (again, I clean it first). Regardless, you want a brush that is quite soft to help blend the colour out. If I’m talking utter gibberish on the outer v, take five minutes to watch Marlena from Makeup Geek explaining the outer v. Bless her, this gorgeous lady clicked on that eyeshadow virgins like me were lagging behind. Click here. Hallelujah! The easiest part of the eye to find! Feel around the top of your eye for the bone: That’s it, right there underneath your eyebrows. Use light colours on the browbone, complimentary to the shades used on your eyelid, but close to your own skin shade. Why? Eyeshadows here are used for two reasons: Firstly to act as a highlight (if you’ve used a shade with a slight shimmer to it, this will attract the light and have a lovely soft glow). The other reason is to help with the overall blending of your eyeshadow look. If you’ve got any remaining harsh lines from your crease blending you can pull down some of your browbone highlight to soften the look. Matt or frost? This is your call. My personal preference is to balance out my overall look by doing the opposite of what I’ve applied everywhere else. If I have matt colours on my lid, I’ll go with something with a bit of shimmer. If I’ve got shimmer on the lid, I’ll go with a matt colour on the browbone that’s the same colour as my natural skin tone, or a bit lighter. Remember that disco ball analogy? I’m trying to avoid that. My favourite brow highlights are: Foxy from my Naked 2 palette, MAC’s Brule eyeshadow and my Pixi Wide Awake Crayon. I’m also desperately eyeing up MAC’s Nylon eyeshadow which is apparently amazeballs as an inner corner highlight. I know I’m going to fold like a cheap pocket knife (sooner rather) than later and just get it. Sigh. This is often called the eye rim and colour applied here creates a more intense effect. Note, if you have sensitive eyes: Skip this step. I like to wear MAC’s Coffee eyeliner, a dark brown shade, on my waterline. I reckon it makes my brown eyes really stand out. I seem to have a lot of friends with green eyes, MAC’s Prunella is simply breathtaking on greenies as the burgundy undertones makes their “eyes pop”. Black is good too – though I often think it can look a little harsh: I much prefer brown. Check out the blue liner on the waterline! Trendsetter. 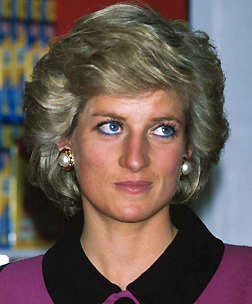 When I was a kid I was fascinated with Princess Diana’s makeup: Remember the bright blue eyeliner she used to wear on her waterline? What a trendsetter she was. You don’t have to wear dark shades though. When I’m looking knackered I love to wear the ‘lighten’ end of my Pixi Wide Awake Crayon on my lower waterline. This is a flesh/skin colour: If I put this on my red and tired waterline: It neutralises it back to ‘normal’ – no more tired eyes! One thing to note, often product applied on the waterline doesn’t last long. That’s because the area is wet. Top tip: Dry the waterline off with a cotton bud then apply eyeliner. That should help it stay put for longer. Otherwise, I highly recommend opting for a long lasting product like a waterproof one e.g. eyeliner or a gel eyeliner. Urban Decay’s 24/7 eyeliners, as well as Smashbox waterproof kohl eyeliners are fantastic. Gel eyeliners are also gold: Maybelline, MAC, Smashbox and Bobbi Browns make gel eyeliners to watch out for. I didn’t show this in the diagram, but the upper waterline is the top rim of your eye directly underneath your upper lash line. If you look in the mirror and look up, you’ll see a tiny bit of space. You can apply eyeliner here too, it’s called tightlining. Again, if your eyes are sensitive: Flag this trick. 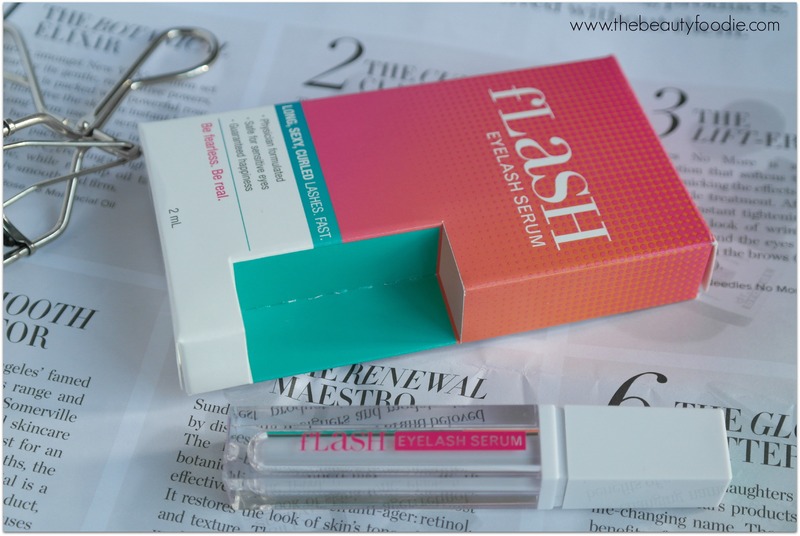 Tightlining is, hands down, one of my favourite eye makeup application tips: It helps create thick and dramatic looking eyelashes, without even touching your eyelashes! I wear Urban Decay’s 24/7 eyeliner in Perversion*** here every day. This is a jet black waterproof eyeliner that Does. Not. Budge. Miraculous. *How my makeup obsession started is another blog post. 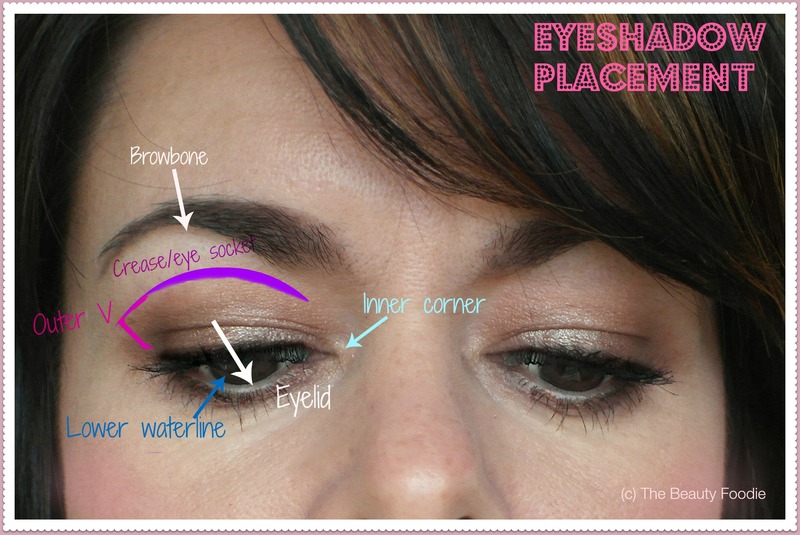 ** Eyeshadow application for hooded eyes is also another blog post. Let me know if you’d like to see this! *** Urban Decay come up with THE BEST product names. If I worked in marketing, I’d want to work in their product naming team. PS: In case you missed three references to this product, Pixi’s Wide Awake Crayon is pretty damn good and I wouldn’t be without mine. I’m not sponsored. I buy my makeup with my own hard earned cash! Pixi Wide Awake Crayon. Love.